The Karbi Anglong District Students Union (KADSU)-AASU stage protest in various places of Karbi Anglong district against the Citizenship (Amendment) Bill 2016 (CAB) and Prime Minister Narendra Modi’s visit to the state on Saturday. In Diphu the KADSU protested by burning the effigy of PM Modi at police point in Diphu market near Diphu post office. The protesters shouted slogans against the prime minister and against the bill. Slogans of “Narendra Modi Hakthu, Hakthu” was shouted at the protest. 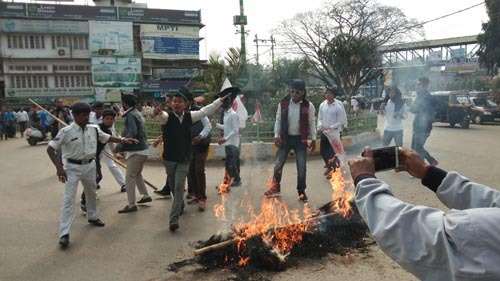 As the AASU activists were protesting a policeman tried to put out the fire but KADSU General Secretary Sorjon Hanse prevented him from doing so. AASU, Diphu Regional Vice President Hemanta Gogoi, Secretary Nekib Ali, KADSU, General Secretary, Sorjon Hanse, Secretary, Aldrin Rongpi and others took part in the protest. The 12 hour bandh called by Tai Ahom Yuva Parishad against the CAB had no effect in the district of Karbi Anglong and West Karbi Anglong. Schools, Diphu Government College, and the markets were open. Long distance buses did not run but other passenger vehicles plied on the roads normally. In Diphu there was no effect of the bandh. In Karbi Anglong district, places like Vothung Aji, Bakalia, and Dokmoka were open. Kheroni, Jengkha, Dongkamukam and Vothatlangso in West Karbi Anglong were open. Educational institutions and government offices functioned normally.